You deserve Oscar De La Renta for your wedding day! You do! I got so many compliments for this dress, and more importantly, I felt just so damn glamorous all day. I’d actually already bought a beautiful wedding dress that I loved. But then I found this, and became obsessed in a way I’ve never been about clothes before. I’d NEVER owned anything this special, but I grabbed it, knowing you only get to be a bride once (that's my plan, anyway). And it was just perfect. 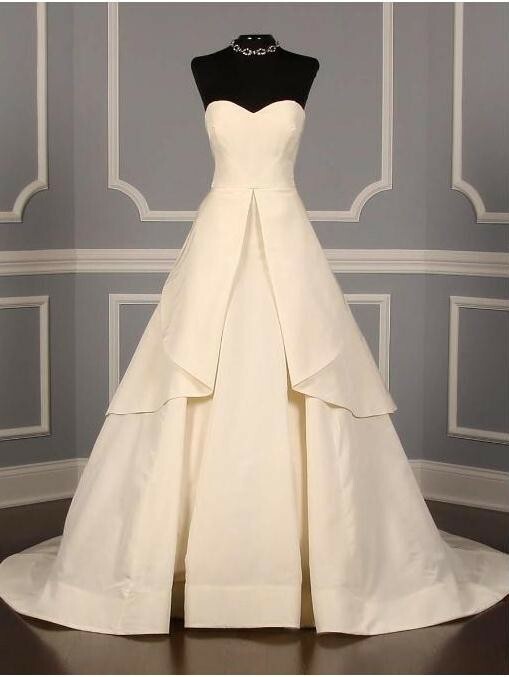 It is an ivory silk faille sweetheart tableau gown – the fabric is gorgeous. And the peplum overlay is what gives it a bit of a twist on a classic design. Although it says US size 8, the dress does run a little small – so if you’re a 10 or 12, it’s worth considering – you can always get it altered a little (wedding dress seamstresses are amazing, aren't they?!). The bodice is boned, but really comfortable, and meant it felt like it was falling down so I didn’t do any of that ungraceful tugging. I’m 5’11 and wore 3 inch heels (tall husband), and had it taken up a bit at the front so it fell beautifully (it was really long! ), and I also had some small, discreet hooks put in (hidden under the top layer) so you can hook up the train and have it all one length (see photo) or if you want to dance (we did one of those fun / cheesey choreographed dances and the dress was perfect). The dress comes with Oscar de la Renta original tag and carry bags. Although I wore it outside, I took great care, and wore a different dress for dancing, and it’s in really great condition. It has been professionally dry cleaned but there is a small brown mark on the hem, and a tiny tear in the inside lining (misplaced shoe, but you can’t see it) and also a few other little marks on the very bottom. I am confident that these will not be visible to anyone. It will look like a new dress. Original purchase price was GBP8,000 (NZ$15,000ish), it is still in fantastic condition, and I’m selling it at a fraction of that. But you can’t buy this dress new in NZ, so it’s going to totally blow everyone away when you walk down the isle! If you want to see picutres close up I am happy to send you more and we can skype/ facetime so you can look it over if that helps. Once you send a message, Emily can invite you to purchase the dress.